the ACTORS WORKSHOP - SIGN UP! New: I have arranged with PayPal to offer Workshop actors the flexibility of taking six months to pay for the Workshop. No interest. So, you can pay up front, or spread it out over six months. It's easy. Your choice. Just click on the "Pay Now" button below. Upon checkout, PayPal will give you the option to use "Bill Me Later". Click on that and PayPal will then set it up for you. Just another option. Hope this helps. 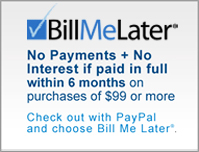 CLICK HERE FOR MORE SPECIFIC INFORMATION ON "BILL ME LATER". It is always difficult to put a price on a workshop. One reason I started the Actors Workshop is due to the sometimes exorbitant prices that are being charged for acting classes. Some are charging thousands of dollars for fewer classes and fewer hours in each class. I have priced the Workshop so that it is more affordable and provides the kind of environment in which actors like to work. I set the Workshop up the way I like to work as an actor. I think you'll like it. I have chosen PayPal as my online processor. It is a safe, fast and convenient way to pay. All major credit cards are accepted and you also have the option to pay using an electronic check. You DO NOT need a PayPal account in order to use PayPal. As I mentioned above, you can also take up to six months to pay for the Workshop with no interest. When registering please include your cell phone number. Please be aware that occasionally a Workshop session may need to be rescheduled. No refunds.